If you are a chocoholic like me, then, for sure, you know the expression "Chocolate chocolate in chocolate", well, or something like that. So we usually describe something really chocolate, something that we approve and put a tick in the box – "write down and remember forever." When the topic of desserts and chocolate rises, the top lines are always occupied by chocolate mousses, cupcakes with liquid chocolate inside and, of course, brownies. The popularity of the latter is so undeniable and weighty that there are hundreds of recipes and variations. And there are more classic brownies (with nuts only), and "pumped" by chocoholics, in such cookies Oreo (which are still chocolate) are usually added, pieces of chocolate and stuff. Well, how is it possible not to pour all of this with chocolate on top, the holiday should be complete. These brownies are slightly different from the usual ones, unlike the classic Brownie biscuit type, such English words have the characteristic of Fudgy. In general, if in Russian, they are very thick, dense and of course extremely chocolate. 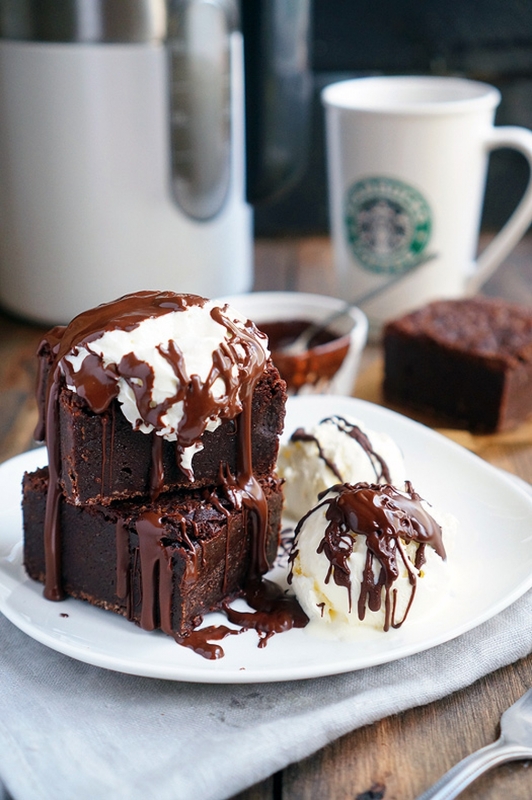 All thanks to the recipe and the low content of flour, because of what Brownies do not become a biscuit, but retain the chocolate-ganache texture. Bite off a piece, you will feel how you cut off a thick, chocolate-saturated texture that instantly spreads in your mouth. After the first piece, it seemed to me that even chocolate is not as chocolate as these brownies. Is better characteristic possible? 1. Fold the broken chocolate (350 g) and butter (230 g) into the saucepan. On medium heat, melt the chocolate and butter so that a uniform and smooth texture is obtained. 2. Pour brown sugar (350 g) in a mass and stir well. From the heat of the mass, the sugar has to melt a little, this is how the correct pull texture will turn out. 3. Wait a couple of minutes and enter 4 eggs and 2 yolks into a mass, stir again. 4. Next, add flour (160 g) and cocoa (5-6 tbsp.). Mix to homogeneity, it is better not to use a mixer, it will be enough to have blades, so we will not cause the appearance of extra bubbles. 5. Pour finished mass into the mold, I used a metal square "ring" (18x18), lined with parchment. 6. Bake at 180 degrees for 30 minutes. Not more! After this, allow the Brownie to cool slightly down on the grate and remove it from the mold. Some asked me why I use such a "ring" in baking. Look what happens as a result – an ideally rectangular shape. There are no familiar rounds after the shapes of the sides, bottom and so on. Here the entire bar of Brownie is suitable for beautiful serving. 7. As a result (if you do not overheat the mass in the oven), you get a sandwich. The thin crust above and below is not more than 2 mm, and in the center there is very tense, rich chocolate mass. To make the pieces cut more beautifully and accurately, keep the brownie (whole bar) in the fridge for a couple of hours, then cut it into pieces with a hot knife. 8. I kept it and then in the fridge, so that the dessert was very elastic and hard, you can store it at room temperature, then it will be softer. For the experiment – divide in half and tell me which texture you like more.